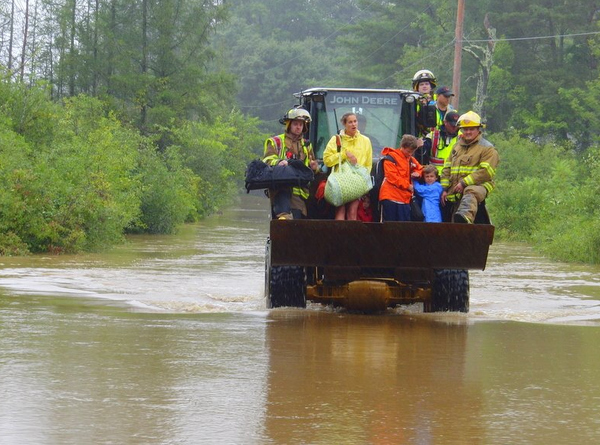 Climate Interactive Co-Director Beth Sawin (who is coping with life in newly flooded Vermont – she and family are okay BTW) posted a timely perspective on this week’s Irene disaster on Romm’s Climate Progress blog and Burlington Free Press. We’re sharing it here as well. My daughter, Jenna, will miss her first day of high school on Wednesday. Woodstock, Vermont, where her school lies, is essentially shut down by flooding. The covered bridge in Quechee I drove across just last week is ruined, and the store where I bought hurricane provisions is just now emerging from floodwaters. Across the state, 13 towns are stranded, 250 roads are impassable and more than 30 bridges are closed. Okay, Irene was no Katrina. My family is fine. But, as a builder of climate simulations that connect burning fossil fuels to destruction like Irene’s, my ‘day job’ in the ‘real world’ and my home-life in a beautiful corner of Vermont finally collided. As climate scientists have been pointing out, a very destructive tropical storm in Vermont following significant spring flooding is the type of disruption of “normal” weather patterns that will become more common as the Earth warms. What now, Vermont? What now, World? Around Vermont today, people are still tallying up the damage, getting water to the thirsty, offering shelter to the newly homeless, and clearing debris from all over. Those spared personal loss are pitching in where we can, volunteering our time, and donating provisions. Attending to these immediate needs is critical, and a measure of our worth as neighbors, but responding to Hurricane Irene won’t be over soon. We face a long and expensive recovery, and, with budgets already tight, our communities face tough decisions. Re-build with a transition to clean energy in mind. If a section of power line needs to be rebuilt, prepare for the smart-grid that can transmit clean energy from wind and solar. If a bridge needs to be replaced, rebuild it with a bicycle lane. If new cable needs to be laid, make sure that it equips remote homes and businesses for the interconnectivity of the digital age. Irene didn’t hit us at a time of business as usual. It arrived at the start of a massive global transition towards an efficient, low-carbon, smart economy. If we can hold onto to the vision of that clean energy future then the necessary work of rebuilding could propel Vermont forward to help lead that transition. Rebuild with future disruption in mind. Like it or not, Vermont is caught up in the same global changes that are contributing to droughts in Africa and the American Southwest, the same forces that spawned last year’s forest fires in Russia and flooding in Pakistan. With more heat-trapping greenhouse gases in the atmosphere, Vermont, like the rest of the planet, will see more extreme weather, including more intense precipitation. We should rebuild our infrastructure with this in mind, knowing that the same streams and rivers that caused such disruption a few days ago likely will not be as quiet for the next hundred years as they have been for the last hundred. Keep the decision making process open. The best decisions for the long-term will solicit the highest levels of democratic participation possible. Vermont’s long tradition of Town Meeting will serve us well in this regard. The voices of the least powerful among us may have the most wisdom when it comes to getting by on less, fixing what is broken, and taking care of one another. Make the links, from dirty energy to devastated communities. Those people most affected by the current crisis have directly experienced some of what the future may hold for more and more of us if greenhouse gas concentrations continue to rise. Though climate scientists will say, correctly, that no single event is the result of climate change, we also know that ‘1- in 100-year’ events are becoming more common. By sharing our experiences and linking them to the wider systemic driver – fossil fuel emissions – we can help explain the true costs of fossil energy (including paying for the costs of climate-change-related disaster relief) and help ensure that even worse disruption doesn’t plague future generations. We’ll pick up the pieces, that’s for sure. But we have the chance to go further than that. We can connect the dots between events we just lived through and global rise in greenhouse gases concentrations, and we can work together with others around the world to help phase out the pollution that makes future Irenes ever more likely. And, as we rebuild, we can make Vermont a stronger, smarter place, powered by clean energy and ready for the extremes our already destabilized climate will likely send our way. Thanks for your insights, Beth. As we walk arm-in-arm into a future that will surprise us on all fronts, we must lean on our resilience and call forth our collective inspired intelligence. I’m glad that you family is safe, and I wish safety for all Vermonters. Thank You Beth. If Vermont – a pretty resource -rich part of US, praised for her sensible decisions is struggling with Irene, what of the parts of the world still deeply under the influence of fossil-fuel based designs, decisions and manipulations. I have just returned from Bhutan where I spend a week with the French inventors of the vertical wind turbines integrated into existing transmission towers, a really clever invention with a workable smart-grid system. They are still running from pillar to post. World will rather put money in disaster management than investing to get out of the very designs that create these disasters. How many more rude awakenings do we need to awaken the global common-sense how much longer to go before systems thinking becomesan integral part of our way of life, not just another design? Thanks Beth for posting this. Our challenge will be to take this moment of recovery and make it truly a transformative one rather than a let’s get back to the same old same old as quick as possible option.